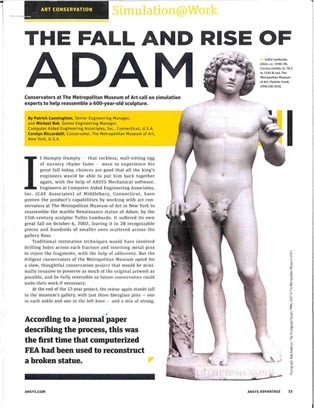 15th Century Statue of Adam Reconstruction – O'Donnell Consulting Engineers, Inc.
O’Donnell Consulting was asked to investigate the cause of the accident that caused the 15th century statue of Adam to fall. We used Ansys software to model the base of the statue. Ansys has recently published an article, which describes how their software was used to reconstruct this priceless statue.